Does whatever a spider… um. Dude, Homer got further than me. Urg. 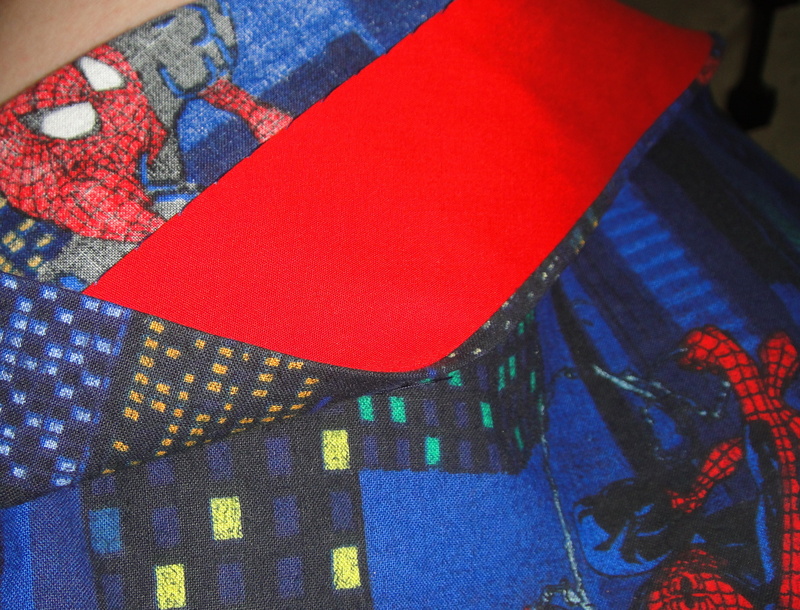 Questionable theme-song rip-offs aside, I proudly present my (almost timely) Spiderman Dress, made of two metres of thrift store Spiderman fabric. 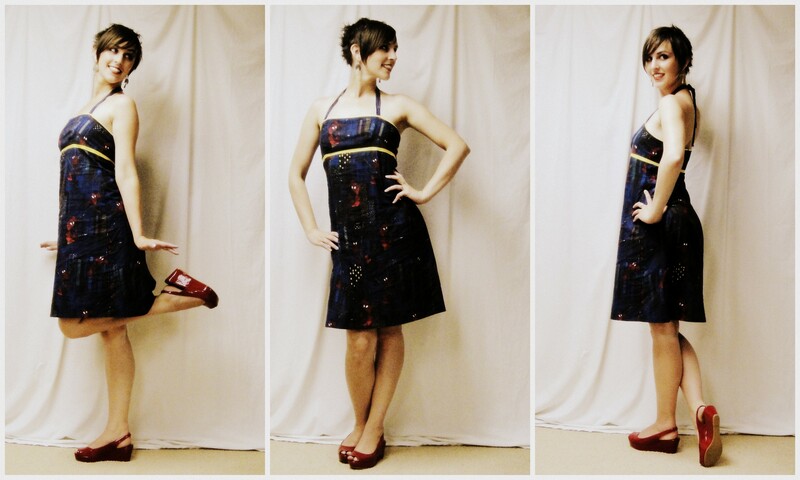 Those of you who know what’s what may recall that Cindy of Cation Designs and I had a totally impromptu sewalong/throwdown for our spiderman dresses. She claims it’s a match of n00b against l33t. I’ll let you decide which is which… I’m pretty sure I just got pwned. (incidentally, my children use “pwned” in conversation. I didn’t even know you could pronounce that word. It’s pronounced “poned,” apparently.) You are warned now, she took totally cool perched-on-top-of-building-photos. I did not. The pattern, as I mentioned before, is New Look 6459. This is actually a fairly recent pattern (2005) and I even remembered to check the reviews on Pattern Review before cutting! Yay me! (I used to do this all the time, but as my obsession with the thrift store pattern set has grown, I got out of the habit. They just don’t have thorough coverage of 1970s patterns on that site for some reason ;).) Anyway, this was my first try at a New Look pattern. The reviews all agreed that the dress ran large. I was a bit puzzled by this, since it does have the allegedly helpful “finished garment size” measurements printed on the pattern itself, and they suggested a very reasonable 1″ of ease at the bust. However, I was suspicious enough to take my measuring-tape to it (it’s a pretty simple pattern, anyway), and sure enough, the amount of ease at the bust in the pattern was much more like 2-3″. Not totally pointy darts. Please ignore the wrinkled state. It’s way too hot to iron right now. Which is a Very Good Thing. So I traced the pattern with a size 10 at the top (I am a size 12 by bust measurement), but past experience has made me wary of A-line skirts in the bottom half department, so I graduated out to the 12 below the waist. Which waist I shortened by about 3 cm. This is all in the skirt, by the way. The bodice piece I traced exactly as a size 10; the only change I made was a bit of careful dart-reshaping in the hopes of avoiding the niplicious look. I also did my usual swayback alteration. In short, I did all my standard alterations except the square shoulder, which obviously doesn’t apply. The waist-height ended up pretty much perfect, so win. The height of the bodice itself is none too generous, however—if you have any kind of a larger bust you would need to add some serious length there to get decent coverage. I wouldn’t have minded an extra half-inch at the top myself, although it’s perfectly wearable as is. I had intended to make View C, but forgot to mark the stitch-line for the notch on the pattern piece and ended up making something resembling view B but with halter ties. Oopsie. I decided the dark print needed something bright to make it pop, and, very uncharacteristically for me, it had to be yellow (to draw on the tiny flecks of yellow windows in the buildings on the print). I tried to talk myself into red, which is much more my style, but nope. It had to be yellow. Fortunately my excessive stash of thrift-store bias binding turned up some bright yellow, so I used that to make a flat piping for the upper edge (much easier since I clean forgot about that notch) and a ribbon-type look on the top of the skirt. Back view. I don’t think I would want it any narrower in the skirt. I find there’s a real tension in sewing between finishing something nicely and being able to fit as you sew. I certainly ran into that a *lot* with this dress. Because of the piping and ribbon, it was impossible to alter the side-seams and take it in there. I wound up taking the excess (yes, even going down a size, I still took out about an inch) at the back zipper (tapering to nothing below the waist), which I think contributes to some of the odd folding around the back, not to mention the way the side-seams run towards the back. Oh, well. I liked the length un-hemmed (remembering I lost an inch when I shortened the waist), so I decided to use up some more stash—this time a red bias hem facing I bought way back when I was finishing my Lady Grey jacket and waffling over the best way to finish that hem. I do like hem facings, although probably this particular fabric didn’t need any more body at the hem. I really like the flash of red there, though. Well, unless I have to go up against Cationess. Just way too much fun. I love the yellow contrast. erm, so pwned is poned? i am at a loss. Now there’s an idea…. Hmm…. I almost thought you were going to swing from one branch to another in webs of frenzy! Wow, webby wonderful and spidera-dee-lightfully gorgeous dress on you, Tanit-isis! 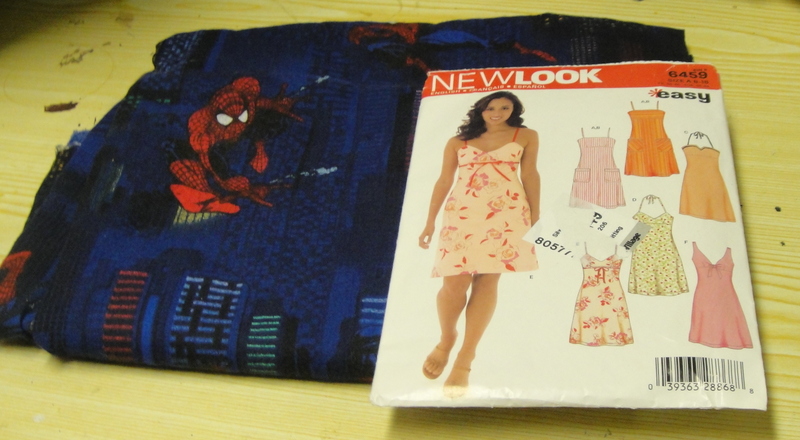 You and Cation inspired my daughter and I go get out our Spidey fabric that has been sitting in my stash for more than a year to sew a top and a ruffle tiered skirt (in my recent blog posts). So thank you very much for getting caught in this spidey web of de-seam! It’s really cute and I really like the yellow contrast, too. The suggestion to edit in some webslinging makes me want to make a spiderman outfit just to do this. Here we often get 25C weather in December and are most July’s are hitting 40C daily. I guess the only thing to call this dress is Amazing! Love the yellow and red touches. Super cute and perfect for our weirdly warm weather. I will now have that theme song in my head all day. Your dress is so much fun. The colour contrast is perfect. Tanit Isis. You are hereby charged with planting ear worms in the ears of your unsuspecting blog readers. Stop this or I will file a cease and desist order against you. Got it? Good. Cute dress. I love the hem facing. Such a nice touch. Emma stone has some serious threads on during the Spiderman press tour, but ill bet she wishes she had this! Aaaahhh I love it! To be perfectly honest, I looked at the pattern and thought it couldn’t possibly be that great…but I am continually amazed at how you can take a normal pattern and jazz it up and make it look HOT. The pops of yellow were such a great idea, and I like the dark mood of your fabric more than my tie-dye madness. Anyway, I think we should make a pact to both wear these dresses when we see it on DVD! Thanks again for suggesting this sewdown and pushing me to finish! You and Cindy are legendary!!!! Love both the dresses! 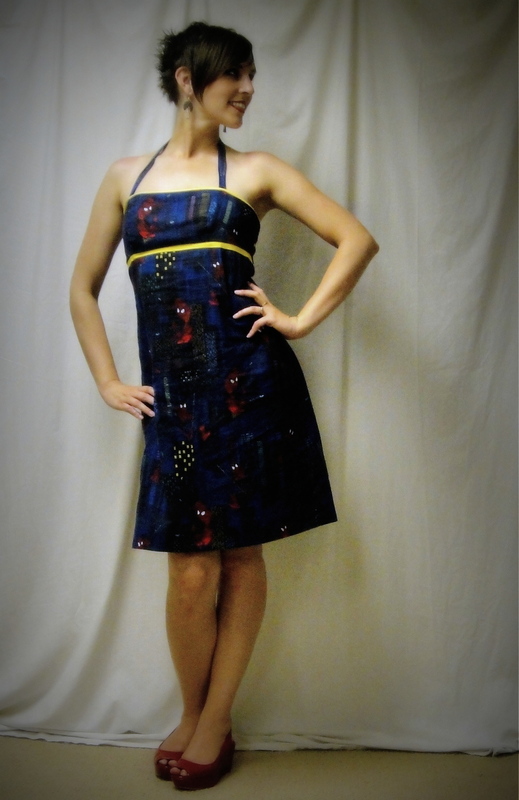 What a cool sew-along challenge! The end of the song should clearly be: Does whatever a spider does best. Because this dress is AMAZING….I think you did a great job with the pattern, and I have to take some out of the back every time too with New Look. It seems to be the way they’re drafted. Now you need to MAKE an occasion to wear this! I love that you used the work “niplicious” in your post! I love your spidey dress, I have a “Peanuts” print that I want to make into a a retro style dress! Oh, that would be an awesome retro dress! Do it! YES! I’m so glad you did this. It is AWESOME. I think the yellow was brilliant. The print doesn’t read as “spiderman” from far away. Have you seen the photo of the lizard that looks like spiderman? Sorry, I just caught it on the web this morning. Check it out. I will forgive you for spider pig resonating in my brain all last night as both dresses are amazing and the photoshopped photo is fab! How about: Spider dress, Spider dress/ Great to wear playing spider-chess. This is so cool, and I like how it’s a basic dress with cool details (the fabric! the yellow! the awesome red flash of facings! ), and from what I hear the rest of Canada is going through, will be perfect for the hot weather. Me, I’m considering a dress today, although I’ll have to wear tights underneath or else I’ll freeze! 😀 Yay Yukon weather! Enjoy the heck out of your dress! Yeah, you will totally kick all our butts in the weather department. I don’t think I could live without the hot summers…. spider dress! spider dress! it is not what you’d guess! Is it fuzzy? no its not! because its a summer dress! Fab dress and pics and yay you are having some hot weather. Perfect all around then Not sure about the weird language thingy at the beginning. What is it? Me thinks I’m too old. Man and I thought text lingo was complicated. Very very cool. I like the yellow, it really stands out more than red would. Yay! I love this dress! The yellow trim is perfect!